Turn west off the Newell Highway in Parkes into Victoria Street (turn left if coming from Forbes, right if coming from Dubbo. The entrance to the Showground is opposite house no 89 in Victoria Street. Please check in with Caretaker Lofty on arrival at his house past the stable blocks. 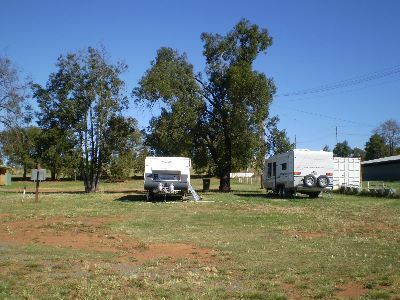 During January, Parkes hosts the Elvis Festival and during this time the showground accommodates 376 powered sites for caravans and motorhomes. Booking for this event is essential. Please phone Kaye 0431 391 849 to book a space. Elvis Festival 10 January 2018, fully booked wait list only available. The annual Parkes Show commences the last Monday in August for a three day show. There is limited room for campers at this time, and bookings are required. The Country Music Festival is held in Parkes on the October long weekend. Please write your message to Parkes Showground in the message box. We will make sure that they get your message ASAP.